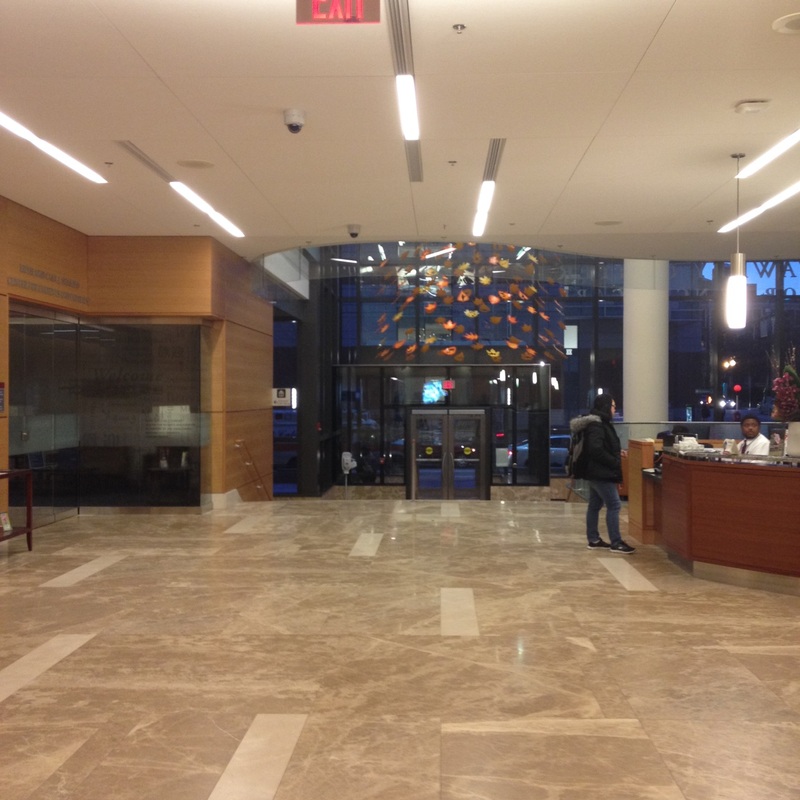 On Wednesday, January 29, 2014 the BAC’s Interior Design Society hosted a guided tour of the Yawkey Center for Cancer Care at the Dana Farber Cancer Institute in Brookline, MA. A group of enthusiastic BAC graduate and undergraduate design students had the opportunity to learn about Dana Farber’s innovative ‘bench to bedside’ design concept. A delivery model for new modes of clinical research designed to bring better treatments to patients more quickly and safely. The tour was led by senior architect Stephen Paquin who currently works for Facilities Management and Real Estate at Dana Farber. 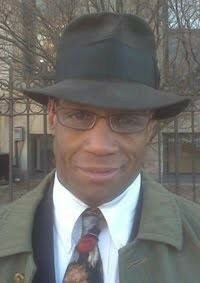 He originally was part of the design team for the new Yawkey Center while working for Miller Dyer Spears, the associate firm for the project. 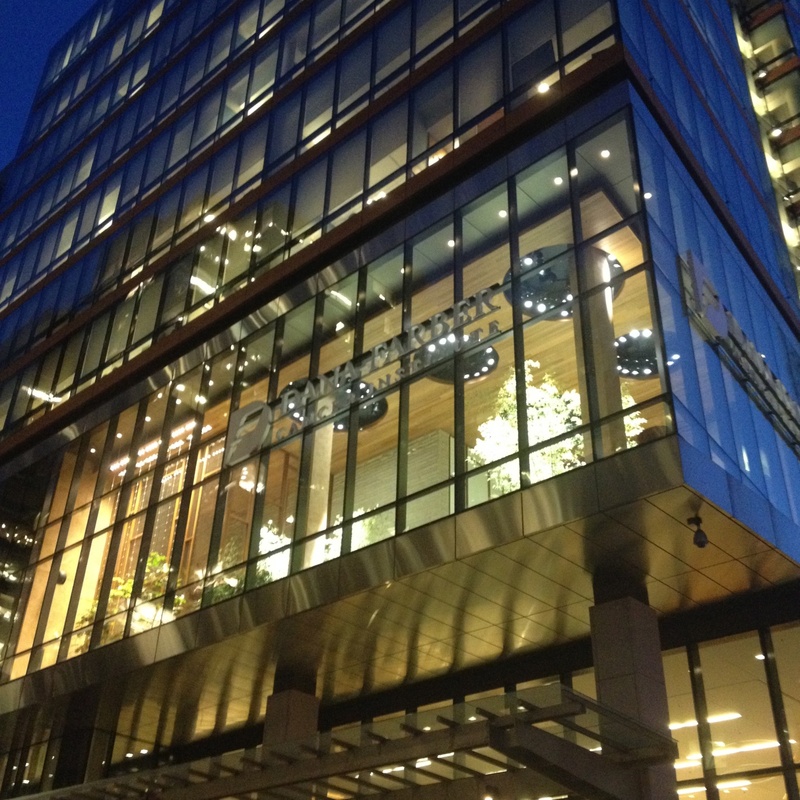 The building was completed in January 2011 at a cost of $325 million with LEED Gold Certification. 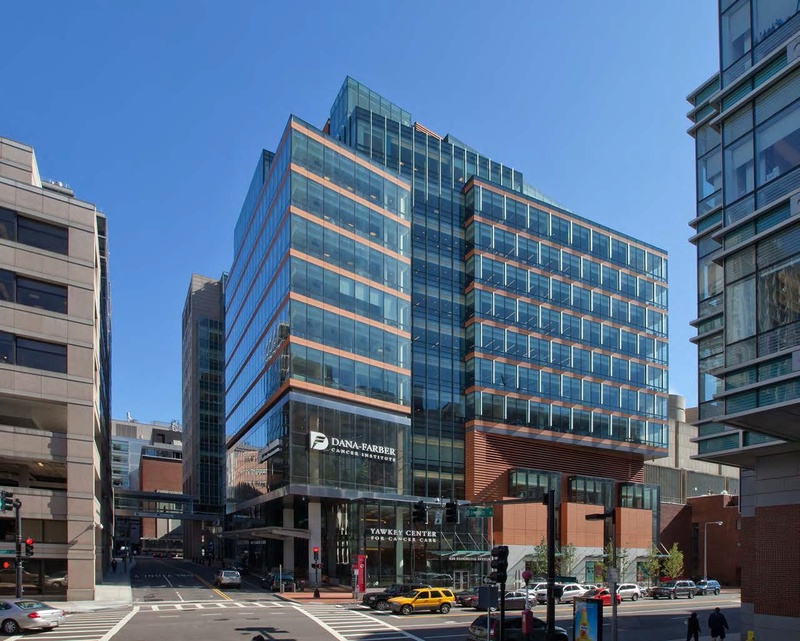 It is 285,000 SF in size and rises 14 stories above grade providing clinical care, clinical research, and public services for dining, retail and quiet reflection spaces. A few of the design goals for the Yawkey Center were to optimize flexibility and utility of space, streamline the flow of patients and materials, minimize wait and treatment times, foster productivity and collaboration of staff. Stephen guided us through the facility as a patient would experience a regular visit. Every patient begins their experience when they arrive at the additional 215,000 SF of parking spaces distributed in seven underground levels, where all are greeted with general valet service. They proceed to the second floor where they immediately arrive at the Central Registration desk. Here all patient information and medical records are obtained and immediately sent electronically to their specific treatment floor. 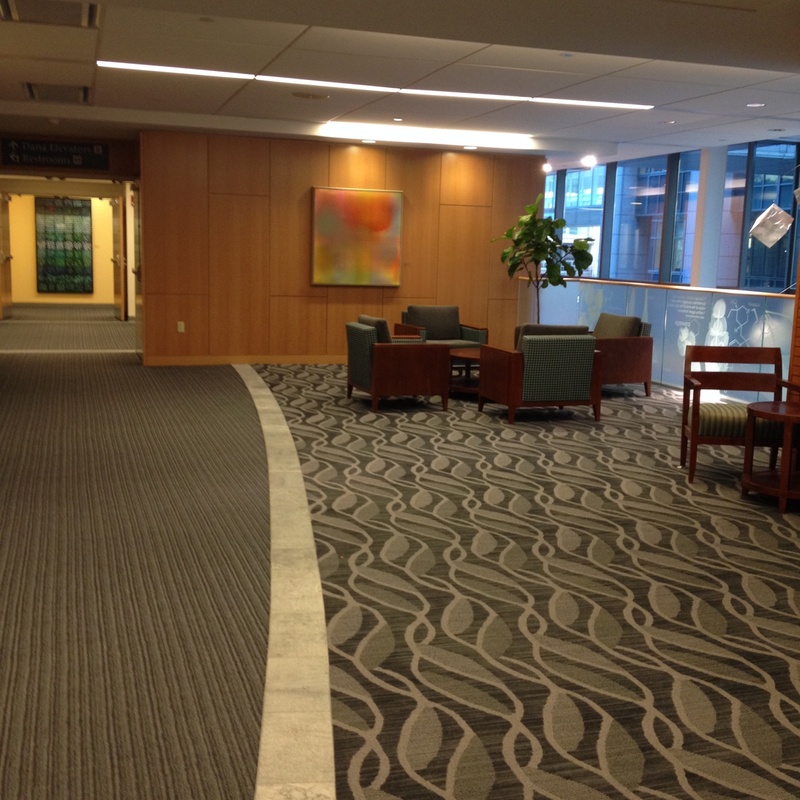 The second floor also provides a waiting room, outpatient pharmacy, chapel and spiritual care. 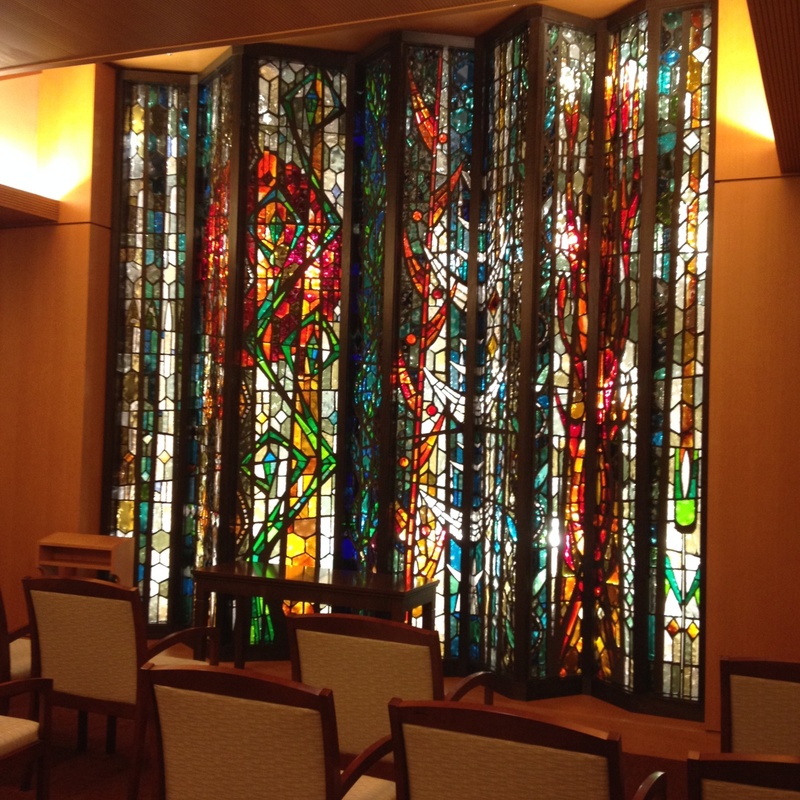 The chapel incorporates a beautiful backlit stained-glass curtain panel that serves as focal point in this space of reflection. 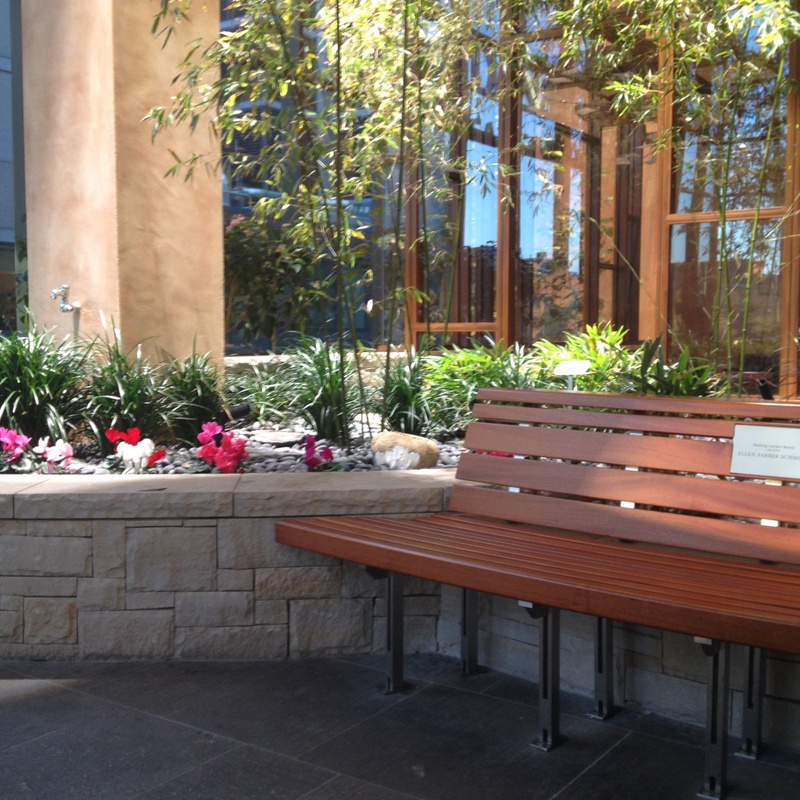 On the third floor and visible from street level at the corner of Brookline Avenue and Jimmy Fund Way, a two-story interior healing garden provides occupants with a year-round connection to the natural environment. The air quality in this space is monitored to ensure a healthful environment. This floor also includes a dining pavilion, an art gallery and a conference center. The building program includes 100 exam rooms with a typical area of 130 SF each. This measurement was a key element to allow these spaces to be flexible and allow for future adaptations. 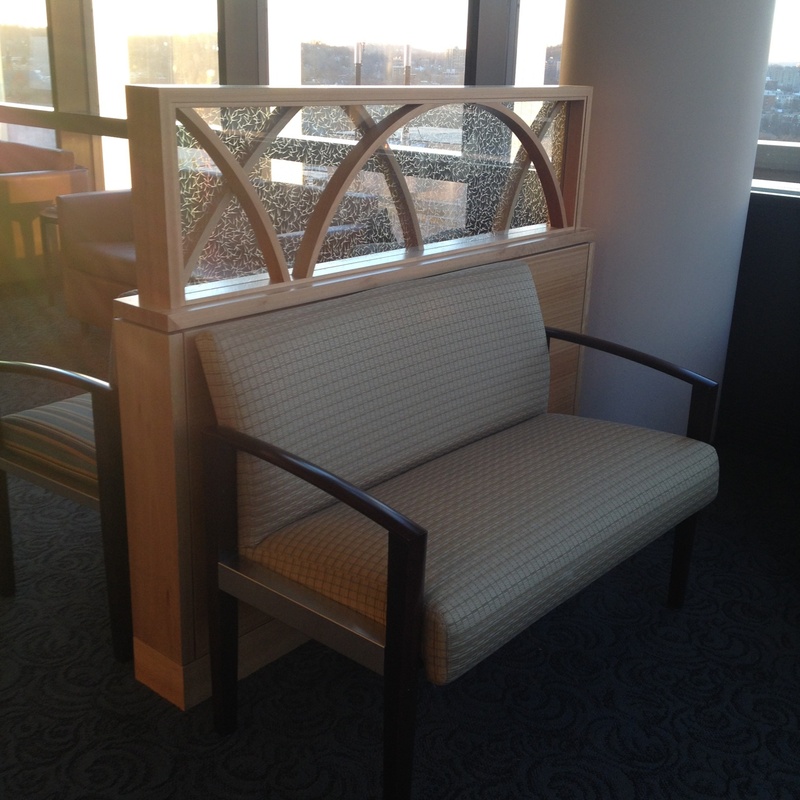 As Stephen described, if needed, they would be able to tear down a wall partition dividing two 130 SF exam rooms and easily adapt the space to become one room with three infusion chairs. There are 150 infusion chairs including clinical research, and 20 consultation rooms. 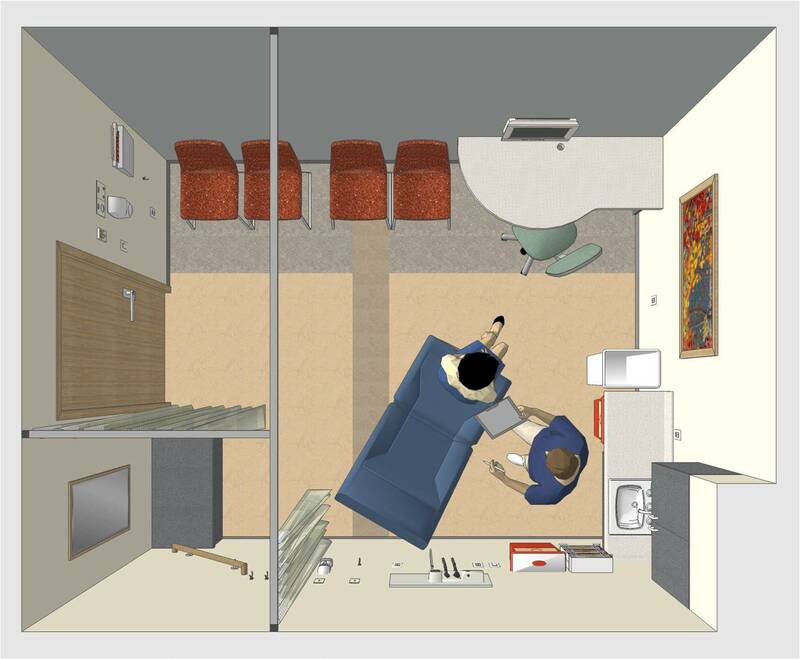 Stephen described how close attention to detail was critical to the design layout of each exam room. The entry door is strategically located on the center of the wall and swings into the room so that it provides a private changing area for the patient behind the door. In some rooms this area incorporates a sink/toilet combination. In order to create a more comfortable and welcoming environment for patients in the exam room, a portrait was placed on the wall opposite the entry which immediately gives the patient a sense of tranquility and safety entering the room. It is very common that patients bring along family members to their treatments sessions. Exams rooms were designed so that there are two functional zones when in use. A provider zone on one side of the room allows physicians to perform their job without having family members obstruct their path. The family member zone on the opposite side of the room allows for up to 3 chairs and a folding chair for additional use if needed. The desks incorporate a rounded edge that allows patients and physicians to have a more engaged and welcoming conversation. Infusion chairs in all infusion rooms feature heat, and massage capabilities for long periods of treatment. There is a mixture of both public and private areas of infusion for patients to choose from. Sometimes patients do not want the added anxiety of being in the same room with other patients. On these areas TVs are provided and pillow speakers can be connected to their infusion chair so others are not disturbed. 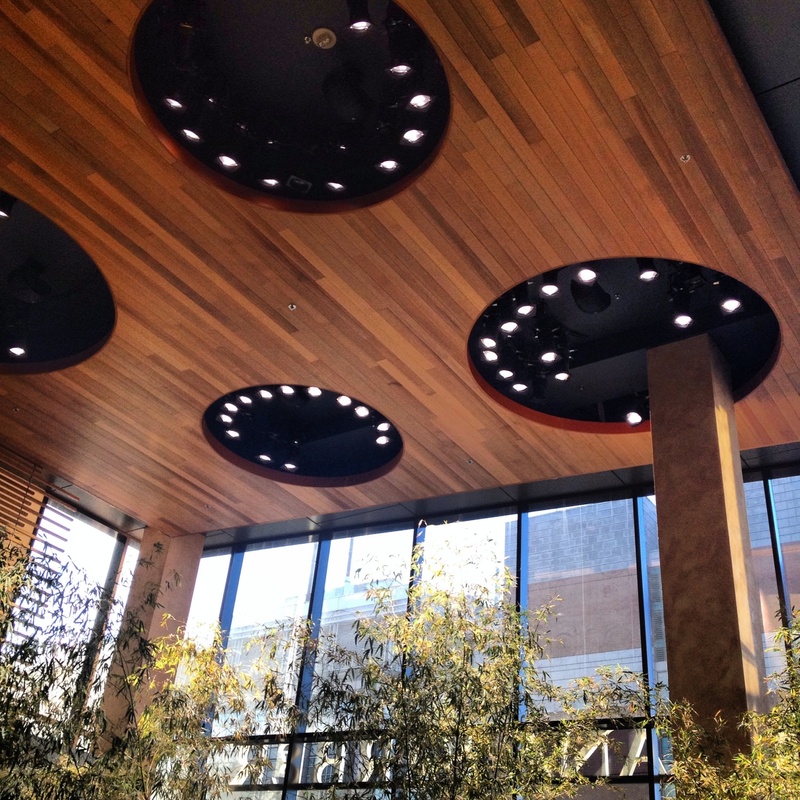 BAC IDS thanks Stephen Paquin and the Dana Farber Cancer Institute for allowing the Interior Design Society to tour your facility.